On February 16, 2017, while speaking at a NATO conference in Brussels, US Defense Secretary James Mattis accused Russia of violating international law, labeling its actions as “aggressive” and “destabilizing.” He also said there is “very little doubt” that Russia has interfered in a number of democratic elections. The same day far away from Brussels, in Baku, the capital of Azerbaijan, a meeting between U.S. Marine General Joseph Dunford, chairman of the Joint Chiefs of Staff, and the head of the Russian General Staff, Valery Gerasimov, took place. General Gerasimov, who led the Russian delegation, is the same person that developed the current Russian “hybrid war” strategy known as the Gerasimov doctrine. According to the doctrine, in the future, wars will be fought with a four-to-one ratio of nonmilitary to military measures. The former should include efforts to shape the political and social landscape of the adversary through subversion, espionage, propaganda, and cyberattacks. The annexation of the Crimea by Putin’s Russia in 2014 is an example of such a war. But why was the meeting organized in Baku? The New York Times wrote that the Russian side suggested meeting in Moscow or Belarus, but the Pentagon would have preferred Europe. However, General Gerasimov could not come to Europe due the travel ban imposed on him in the European Union. The newspaper concluded: “Eventually Baku was selected as a neutral location.” But why Baku, why not Moscow? There could be a possible explanation for the selected city. In November 2013, Donald Trump organized the “Miss Universe” beauty contest in Moscow, which he owned from 1996 to 2015, together with NBC. 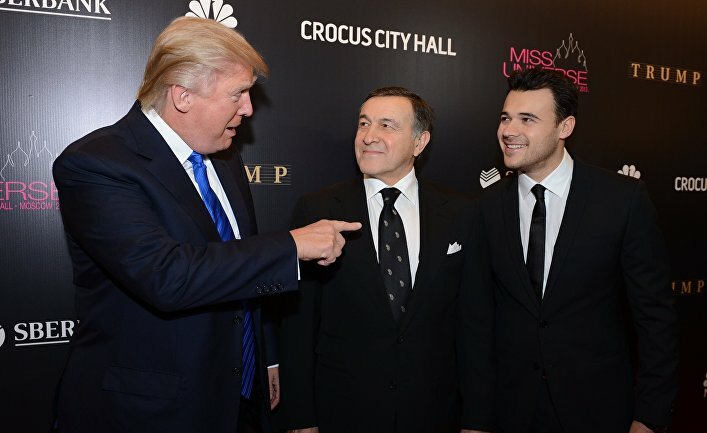 For holding the contest in “Crocus City Hall” in Moscow, Trump received $14 million from the Russian-Azeri businessman Aras Agalarov (owner of the Crocus Group) and other investors. Agalarov and Trump met For the first time a few months earlier at the Trump hotel in Las Vegas, after Agalarov’s son Emin hired a Miss Universe winner to appear in one of his music videos. Aras Agalarov was born in Baku, Azerbaijan in 1955 and has made a Forbes-estimated fortune of nearly $1.3 billion in real estate development. His company, Crocus Group, has won contracts from Putin’s Kremlin, including for two World Soccer Cub 2018 stadiums. He developed a luxury housing community for the most wealthy oligarchs outside of Moscow with a manmade beach and waterfall, and housing for his residents’ hundreds of bodyguards. He also owns a high-end shopping mall and the largest exposition building in Moscow. Agalarov has quite a dubious reputation in Russia due to some mafia connections. In 2008, Agalarov was awarded with the Order of Merit of the Italian Republic, supposedly for his significant contribution to the history of the development of economic relations between Russia and Italy. In June 2013, Russian President Putin awarded Agalarov the Order of Honor. According to Forbes, in 2016 Agalarov was in 55th place among Russian wealthiest oligarchs. The same year he bought a condo for $10.7 million on Miami’s Fisher Island, South Florida. Agalarov’s son Emin (born in 1979 in Baku) is first vice president of the Crocus Group. He attendded a school in Switzerland and graduated from Marymount Manhattan College (New York). His sister Sheila graduated from the Fashion Institute of Technology (also New York), and lives in the U.S. In addition to being a businessman, Agalarov Jr. is a pop singer. In Moscow, Trump participated in Agalarov’s music video “In Another Life.” As The Washington Post put it, “on a set that looked like “The Apprentice”, Trump played himself while Emin daydreamed about bikini-clad pageant contestants until Trump finally told him, “You’re fired.” The father and son Agalarovs also opened two restaurants in Moscow with the Japanese kitchen Nobu, the brand created by the American actor Robert de Niro and chef Nobuyuki Matsuhis. The contest “Miss Universe” […] we conducted jointly with Donald in the “Crocus City Hall.” And then there was a big celebration after the final. […] Donald was with us until the morning, until the departure, and from there went straight to the airport. He really liked it, was very warm with all he talked to, a bunch of artists performed, and it was interesting and we had fun. In general, communication with him was very positive. […] Donald Trump is very positive, warm, warm person, and I think he will be very unusual and tough President. Trump was very enthusiastic about the contest and boasted: “Almost all of the [Russian] oligarchs were in the room.” There was also present one of the closest Putin’s co-workers and assistants Vladimir Kozhin (who the following year was sanctioned in the U.S. in response to Russia’s invasion of Ukraine). However, the Agalarov father and son have the highest connections not only in Moscow, but also in Baku. Agalarov Sn. was born in Baku and in 1977, he graduated from the Baku Polytechnic Institute (currently, Azerbaijan Technical University) as a computer engineer, and before he moved to Moscow in 1983, he worked in a research institute in Baku, and then, in Baku City Committee of the Communist Party. From 1983 to 1987, he attended the Higher School of Soviet Trade Unions (currently, Academy of Labor and Social Relations) in Moscow. From 1988 to 1990, Agalarov worked at the Scientific Center for Soviet Trade Unions. Apparently, while working at the highest level of Soviet Trade Unions, he acquired a lot of useful Moscow contacts. But Aglarov’s connection with Azerbaijan continued. Since 2002, he has been vice chair of the All-Russian Azeri Congress, the union of the Azeri diaspora. Agalorov Jr. is even more connected with Azerbaijain than his father. From 2006 to 2015, he was married to Leila Alieva, the elder daughter of the current Azerbaijani dictator Ilham Aliev, and the granddaughter of the Azerbaijani “Tsar” of the Soviet period, First Communist Party Secretary Heydar Aliev. She attended schools in Switzerland and England, and attended the European School of Business. Leila and Emin have two sons and an adopted daughter. In 2010 Leyla, her sister Arzu, and then 11-year-old brother Heydar owned real estate in Dubai worth about $75 million. Before Trump left Moscow in 2013, he negotiated with Agalarov about the construction of a Trump Tower in Moscow and, according to Agalarov, even signed a contract. Emin Agalarov boasted: “I convinced my father that it would be cool to build a Trump Tower next to the Agalarov Tower, and he became interested in the project.” For the meeting with the Agalarovs, Trump brought Alex Sapir and Rotem Rosen, two New York-based Russian émigré developers who had helped to develop the Trump Soho hotel and condominium project in Manhattan. Trump’s company was intending to build a high-rise apartment building of 100 sq. meters on the land near Moscow that belongs to the Crocus Group. However, the project stalled after the preliminary discussion stage. During the 2013 visit, Trump hoped for a personal meeting with Russian President Vladimir Putin. Months before the contest event he twitted: “Do you think Putin will be going to The Miss Universe Pageant in November in Moscow – if so, will he become my new best friend?” The meeting, however, did not take place. President Putin’s present – a lacquer box – and a friendly letter was sent to Trump later, when he had already arrived in New York. Taking into consideration all the above said, it becomes clear that, possibly, the city of Baku was not chosen for the meeting of the generals because it is neutral territory.